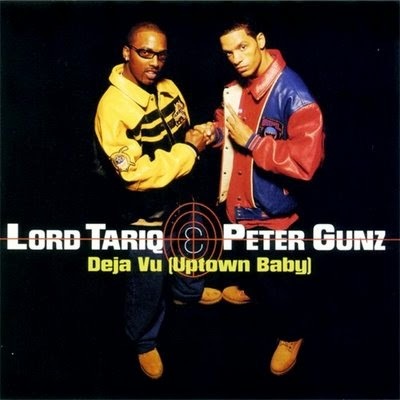 Lord Tariq and Peter Gunz gave us the hit single Deja Vu (Uptown Baby) from their debut (and only) album, Make It Reign, in early 98. This was easily the most commercially successful track on the album, going platinum (in less than 4 months) and topping at #9 on the Billboard 100. This even became one of the staple summer tracks of 98. No BBQ was safe. The Bronx duo gave us that 90's flow on a simple yet classic instrumental. This track actually peeked my interest from the first trumpet notes of the instrumental. It took a sample from the hit salsa single, Amores Como El Nuestro (Youtube it). This was the singers, Jerry Rivera's, biggest hit off of his biggest album. He won single and album of year for the album Cuenta Conmigo. So for the past 6 years or so, this song was a staple at all family gatherings. And to hear a hip hop song sample something from "my world/culture" was huge to me. So sit back, dust off the boombox or walkman..and enjoy.